mediAvatar iPad PDF Transfer is featured as PDF/EPUB eBooks transfer iPad software to transfer PDF/EPUB eBooks between iPad and PC as well as backup PDF/EPUB files to iTunes. With mediaAvatar iPad PDF Transfer, you are enabled to transfer favorite PDF/EPUB eBooks from PC to iPad for enjoying them on Apple tablet anywhere anytime. You can also transfer PDF/EPUB files between your iPhone/iPod touch and PC or iTunes. All iPad/iPod touch/iPhone models (Except iPhone 1st) are supported. Download mediaAvatar iPad PDF Transfer for free now and experience the fast eBooks transferring between iPad, PC and iTunes! Transfer PDF/EPUB eBooks on your PC to iPad just by drag and drop. Copy iPad PDF/EPUB eBooks to your computer for backup in superbly fast speed. Transfer iPad PDF/EPUB eBooks to iTunes as a backup. Easy and secure! 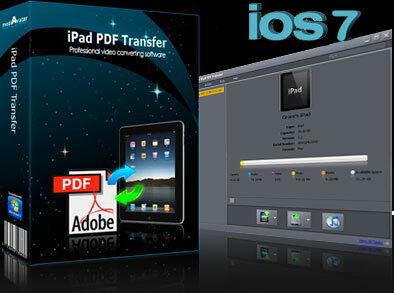 Superb performance on file transferring between iPad/iPod touch/iPhone, PC and iTunes. Automatically detect the connected iPad/iPod touch/iPhone, and show you the detailed information like type, capacity, version number, serial number and format. This iPad PDF transfer software enables you to transfer a batch of PDF/EPUB eBooks simultaneously to save time and effort. Auto-exit the application, shut down, hibernate the computer, or do nothing after tasks is complete. The interface is available in languages of English, French, Spanish, Italian and German.